NEWPORT, RI, September 10 -- Not much in the way of sun but a full complement of northwest wind and a ripping ebb tide -- at least for a while -- greeted the 24 yacht-club teams in the U.S. 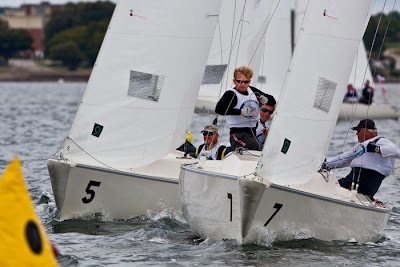 Qualifying Series of the NYYC Invitational Cup, sponsored by Sperry Top-Sider and Jaguar North America. Preliminary rounds were completed on Thursday, and the fleet was divided into Gold in Sonars and Silver in J/22s. Yesterday’s scores are history. After six races on Friday, Annapolis, Peter McChesney, is tied for first with 24 points in the Gold Fleet. Showing the same score is Eastern, Bill Lynn, the Sonar World Champion in 2007. Then comes Newport Harbor, Payson Infelise, and American, Peter Duncan. Pequot, Dave Rosow, and San Francisco, Sean Bennett, are tied for fifth. For the Silver Fleet, St. Francis, Russ Silvestri, is first with four wins and 16 points, followed by Seawanhaka, Al Constants. Ida Lewis, Jamie Hilton, and Southern, Scott Sonnier, are tied with 28 points and then comes San Diego, Bill Campbell and Rochester, Kris Werner.